Natural Disaster: I Cover Them. I Am One. is Ginger's heartbreaking, hilarious, and harshly honest life story-from Dickhead's (you won't soon forget that name) deck on Lake Michigan to her storm-chasing dream at ABC News. Ginger opens up about her lifelong battle with crippling depression, her romances that ranged from misguided to dangerous, and her tumultuous professional path. 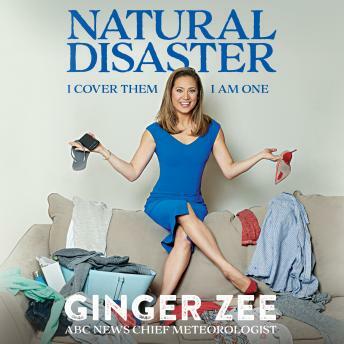 This cyclone of stories may sound familiar to some-it's just that Ginger's personal tempests happened while she was covering some of the most devastating storms in recent history, including a ferocious tornado that killed a legend in the meteorology field. She also canceled her first wedding-twice-because she finally listened to her inner voice, which was saying, This isn't right, but then she happened to fall in love with her gay best friend. Yes, twice. Yes, gay. On the sunny side, this book is for all the mistake makers who have learned to forgive others and themselves-even in the aftermath of man-made, or in this case Ginger-made, disasters. It's a story that every young woman should read, a story about finding love in the world and finding it in yourself. Beloved by Good Morning America's audience, Ginger is a daily presence for millions. She's gained fame for her social media presence, which is as unfiltered as Natural Disaster-from baby barf to doggy doo-doo. She's shattered the glass ceiling for women in meteorology but admits here first she's the one natural disaster she couldn't have forecast. This is an outstanding book. The author who narrates the book herself is very candid about her journey. She shares critical moments in her life with Candor but also humor. For anyone that has ever struggled with depression or dysfunctional relationships, she is encouraging and gives a great perspective. I would highly recommend this book.